Pastor Mary Janz and Pastor Jhon Freddy Correa recommended to the Emmaus council on April 21 that an official consolidation of Emmaus and Emaús be considered. 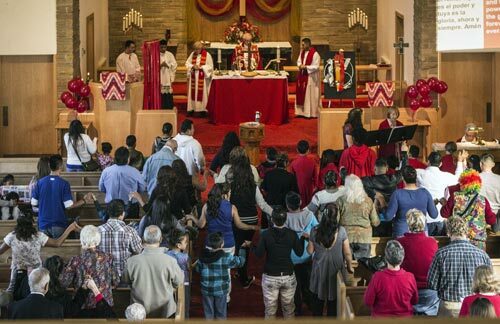 After discussion, the council decided to recommend pursuing that possibility, which proposed consideration of calling of a bilingual lead pastor to serve this newly formed congregation. As part of the process, a short-term advisory team was formed. Members of the team included Kathy Christensen, Carol Eschmann, Stacy Steinike, Melissa Lemke, Pablo Enriquez, Soledad Beltran, and Trinidad and Antelmo Hernando. The advisory team met April 26 to ask questions and to discuss how to proceed. They proposed that after the worship services on May 2 and 3 the pastors present the proposal, allowing time for questions and concerns to be aired and ending with an unofficial straw vote about whether to move forward with the concept. Should that process continue, a transition team will then be formed. The first weekend in May, both pastors led the three congregational forums. Those attending (the vast majority of worshipers stayed for the half hour forums following each of the services) were assured that worship would continue both in English and Spanish with the probability of adding a new worship service in the future. It was explained that the lead pastor would preach at half the English services and at half the Spanish services, with guest preachers filling in on the other weeks. Pastor Jhon Freddy said that if plans for this consolidation should materialize, he would then prayerfully consider whether he would be one of the candidates to interview for the position of lead pastor.